Limited time offer – Up to 60,000 bonus miles. 40,000 bonus miles after you spend $2,000 on purchases in the first 3 months your account is open. Plus earn an additional 20,000 bonus miles after you spend $8,000 total on purchases in the first 6 months your account is open. Free first checked bag for both you and a companion (a savings of up to $120 per roundtrip) when you use your Card to purchase your ticket. Expanded award availability. Having this card makes it easier to find that saver award economy ticket. Priority boarding + 2 United Club one-time passes every year for your anniversary. 2X miles at restaurants and on hotel stays. 2X miles per on purchases from United. 25% Back on United inflight purchases (Wi-Fi, Food and Drinks). Use your miles for any seat, any time, on any United flight. This card is very focused on making it a better experience to fly on United. Before you board, you might use one of your free United Club lounge passes. You have the first checked bag for free on United flights, both for your and a companion traveling on the same reservation. The fee is usually $30 per person, each way, so quadrupling that is how they get the value of $120 each roundtrip. You also get Priority Boarding, which helps you find space for your carry-on. While onboard, you get 25% back on your inflight purchases of WiFi, food, and drinks. Expanded award availability. You earn United miles for all your purchases (double miles on restaurants and hotel stays), but then they also make it easier for you to redeem those miles on Saver level tickets with no blackout dates. Expanded award seat availability is another of the top perks from this card, and I’ve found there is actually a significant difference when searching. If you’re constantly trying to find economy tickets for the entire family like me, this is a big deal. Saver Award ticket redemptions start at 12,500 miles one-way within the continental U.S. and Canada. Another unique feature of this card is that it offers primary coverage on the Auto Rental Collision Damage Waiver. On most other consumer cards, this coverage is offered as secondary coverage, meaning it only kicks in after your personal auto insurance has been exhausted. Bottom line. The United Explorer Card offers great perks for folks that fly United even just once or twice a year. The card provides lounge passes, a free checked bag, priority boarding, and inflight discounts. There are bonus categories to earn more miles, and special expanded award seat inventory for credit card holders to make it easier to actually redeem those miles for flights. Right now, there is a limited-time offer up to 60,000 bonus United miles with no annual fee during the first year. I’ll be adding this limited-time offer to my list of Top 10 Best Credit Card Bonus Offers. Earn 60,000 bonus miles after you spend $2,000 in purchases on your new Card within your first 3 months and a $50 statement credit after you make a Delta purchase with your new Card within your first 3 months. Limited Time Offer Ends 05/01/2019. 60,000 Skymiles is worth $600 in Delta airfare minimum. 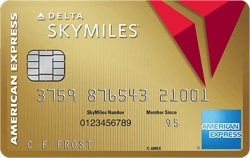 With this card, you get a minimum value out of your Skymiles via the “Pay with Miles” option. 60,000 Skymiles can reduce the price of your Delta ticket by $600 at the very least. (5,000 mile = $50 minimum redemption.) You can still book the traditional award tickets and possibly get better value. First checked bag free. Delta now charges $30 for the first checked bag, each way. That means this perk is worth $60 per person each roundtrip. 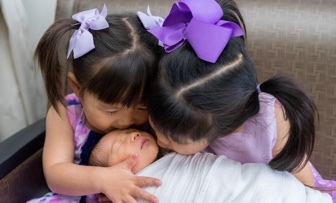 For a family of four, this perk is worth $240 per person each roundtrip. Enjoy Main Cabin 1 Priority Boarding. Annual fee is waived for the first year, then $95. Here is my link for the Gold Delta SkyMiles American Express referral offer. Thanks if you use it. I will be adding this limited-time offer to the Top 10 Best Credit Card Bonus Offers. 60,000 bonus Ultimate Rewards points after $4,000 in purchases within the first 3 months. 25% more value when you redeem for airfare, hotels, car rentals and cruises through Chase Ultimate Rewards. That means 60,000 points are worth $750 toward travel. No blackout dates. As long as there’s a seat on the flight, you can book it through Chase Ultimate Rewards. 2X points on travel and dining at restaurants worldwide. 1 point per dollar spent on all other purchases. Chase Sapphire Preferred named “Best Credit Card for Flexible Travel Redemption” – Kiplinger’s Personal Finance, June 2018. The product is not available to either (i) current cardmembers of any Sapphire credit card, or (ii) previous cardmembers of any Sapphire credit card who received a new cardmember bonus within the last 48 months. Ultimate Rewards points. This card offers a special 25% bonus on travel redemptions made through the Ultimate Rewards travel website. For example, 60,000 Ultimate Rewards = $750 in travel. Similar to Expedia or Travelocity, you can book flights on most major airlines and hotel chains. This makes it much more flexible to spend your points. You can even buy something more expensive and pay the difference. The Chase Sapphire Reserve Card is the “ultra-premium” rewards card that offers a bigger 50% bonus on travel redemptions, along with more perks and a higher annual fee. Prefer airline and/or hotel points? This card also allows you to transfer Ultimate Rewards points into hotel and/or airline miles. Transfer to United Airlines, British Airways, Singapore Airlines, Korean Air, Southwest, Hyatt Hotels, IHG Hotels, and Marriott Hotels at a ratio of 1 Ultimate Rewards point = 1 mile/hotel point. Miles redemption continue to offer great value for savvy travelers, especially for last-minute travel and business class seats. I personally use the transfers to “top off” my account to reach a free coach ticket or free hotel night when I don’t have enough points otherwise. My favorite options are United miles, Southwest miles, and Hyatt hotel points. In this manner, I can often get close to 2 cents per point value. Premium, dedicated customer service line with a live person, 24/7. A real person picks up after a couple rings, no phone trees or typing those darn 16 digits over and over. You can use this feature to redeem cash rewards over the phone for free, although booking rewards tickets over the phone costs $20 (doing so online is free). Bottom line. The Chase Sapphire Preferred Card has a 60,000 Ultimate Rewards points sign-up bonus, 2X points on Dining/Travel, and a $95 annual fee. This card has become quite popular because it is easy on both the earning and redeeming of rewards. Earning double miles on travel and restaurants is a useful category where a lot of people spend a lot of money (that’s not housing or student loans). If you can find a good use for airline miles, you can transfer them over. If you can’t, the 1.25 cent per point value on travel redemptions is easy to use. This is one of the few cards where I think paying the annual fee is worth it. You can only get one Sapphire bonus every 48 months, so compare with the Chase Sapphire Reserve Card, which offers a bigger 50% bonus on travel redemptions, along with more perks and a higher annual fee. I will be updating this improved offer on my list of Top 10 Best Credit Card Bonus Offers. 50,000 bonus United miles after spending $3,000 within the first 3 months. Expanded award availability. Having this card makes it easier to redeem for that saver award economy ticket. Priority boarding for you and companions on the same reservation on United-operated flights. 2X miles at restaurants, gas stations and office supply stores. 2X miles on United purchases and 1 mile per $1 spent on all other purchases. Employee cards at no additional cost. However, you CAN get this card if you had the consumer version of the United Explorer in the past 24 months (or have one now). Many people aren’t aware of the fact that they can apply for business credit cards, even if they are not a corporation or LLC. The business type is called a sole proprietorship, and these days many people are full-time or part-time consultants, freelancers, eBay/Amazon/Etsy sellers, Uber/Lyft drivers, or other one-person business owners. This is the simplest business entity, but it is fully legit and recognized by the IRS. On a business credit card application, you should use your own legal name as the business name, and your Social Security Number as the Tax ID. Note that Chase has an unofficial rule that they will most likely deny approval on new credit cards if you have 5 or more new credit cards from any issuer on your credit report within the past 2 years (aka the 5/24 rule). This rule is designed to discourage folks that apply for high numbers of sign-up bonuses. This rule applies on a per-person basis, so in our household one applies to Chase while the other applies at other card issuers. The good news is that small business cards from Chase hardly ever show up on personal credit reports, so getting this card in itself won’t affect your future 5/24 eligibility. This it makes a “free” application if you are already eligible. This card is very focused on rewarding you for being a United customer. Before you board, you might use one of your free United Club lounge passes. You have the first checked bag for free on United flights, both for your and a companion traveling on the same reservation. The fee is usually $30 per person, each way, so that this how they get the value of $120 each roundtrip. You also get Priority Boarding, which helps you find space for your carry-on. Expanded award availability. You earn United miles for all your purchases (double miles on restaurants and hotel stays), but then they also make it easier for you to redeem those miles on Saver level tickets with no blackout dates. Expanded award seat availability is another of the top perks from this card, and it is actually a significant difference. Saver Award ticket redemptions start at 12,500 miles one-way within the continental U.S. and Canada. Another unique feature of this card is that it offers primary coverage on the Auto Rental Collision Damage Waiver. On many other cards, this coverage is offered as secondary coverage, meaning it only kicks in after your personal auto insurance has been exhausted. Bottom line. The United Explorer Business card offers valuable perks for folks that fly United even just once or twice a year. The card provides lounge passes, a free checked bag, priority boarding, and inflight discounts. There are bonus categories to earn more miles, and special expanded award seat inventory for credit card holders to make it easier to actually redeem those miles for flights. I have added this card to the Top 10 Best Small Business Card Bonus Offers. In my opinion, the main reason to pick the Reserve over the others is if you fly Delta a lot and get enough value out of lounge access via the Delta Sky Club membership. I am disappointed that the perk doesn’t include family members or companions on the same itinerary, however. The First Class companion certificate is also pretty cool, but I am personally unwilling to pay cash for a First Class seat, even if the second one is free ( taxes and fees). You may feel differently. Up to 120,000 total bonus points: Earn 80,000 bonus points after spending $2,000 on purchases within the first three months of account opening an additional 40,000 bonus points after spending a total of $5,000 on purchases within 6 months of account opening. Free Night award after each account anniversary year at eligible IHG hotels worldwide. Valid at IHG® Hotels with a current point redemption level of 40,000 points or less. Plus, enjoy a free reward night when you redeem points for any stay of 4 or more nights. Earn 2 points per $1 spent on purchases at gas stations, grocery stores, and restaurants. Earn 1 point per $1 spent on all other purchases. Global Entry or TSA PreCheck® fee credit of up to $100 every 4 years as reimbursement for the application fee charged to your card. This offer is for the new “IHG Club Premier” card, so this language should mean that if you have the older and different “IHG Club Select” card, you can still apply for this card and get the sign-up bonus. What can you get with IHG points? The best redemption value for IHG points is for free hotel nights. The other options offer significantly less value. While the points don’t translate directly to a dollar value, but overall you should expect around 0.60 cents of value per point. This would place 80,000 IHG points at a $480 value and IHG points at a $720 value. You can perform the calculations for hotels that fit your needs. I tried a bunch of other various combinations and got between 0.5 cents and 0.8 cents per point equivalent value. IHG Rewards Club puts out a new list of PointBreaks hotels every few months where you can redeem a hotel night for only 5,000 to 15,00 points. There are some nice hotels on the list, but the locations are very specific and few people are sufficiently flexible with their travel to constantly take advantage of these deals. However, you could get value of over 1 cent per IHG point with a hotel on this list. IHG points expire after 24 months of inactivity, so if you keep up your activity then you can save up these free nights for later. Chase Ultimate Rewards points also convert to IHG points. Ongoing rewards structure. I might book my IHG nights on this card, but not my everyday purchases on an ongoing basis. Remember that IHG points are worth less than other points like Hyatt or Chase Ultimate Rewards points. 10 IHG points total per $1 spent at IHG properties. 2 IHG points per $1 spent at gas stations, grocery stores, and restaurants. I would consider keeping this card if you can use the anniversary night certificate with the 40,000 point maximum value. You should be able to get $89 value out of it as long as you need a hotel night. Stay must be completed within 12 months from date of issue. I will be adding this new, improved offer to the Top 10 Best Credit Card Bonus Offers. (3) applied and were approved for Marriott Bonvoy BusinessTM American Express® Card (also known as The Starwood Preferred Guest® Business Credit Card from American Express) or Marriott Bonvoy BrilliantTM American Express® Card (also known as the Starwood Preferred Guest® American Express Luxury Card) within the last 90 days. That’s a lot of long card names, but note the different 30-day, 90-day, and 24-month waiting periods that may now include Marriott business cards. (See my Marriott Bonvoy Business American Express Card Review.) This is why you should be looking to get the best possible bonus (like a limited-time offer) if you do apply. The Marriott and Starwood merger is now complete, and you can use these points at either Marriott properties (Ritz-Carlton, Renaissance Hotels, Courtyard, Residence Inn, Springhill Suites, Fairfield Inn & Suites) or former Starwood Properties (Westin, Sheraton, The Luxury Collection, Four Points by Sheraton, W Hotels, St. Regis, Le Méridien, Aloft). You could use 70,000 points on two free nights at a Category 5 hotel like the Courtyard Waikiki Beach in Hawaii on a standard date, or you could get 4 free nights at a Category 3 hotel like the Residence Inn Austin Arboretum. You can still turn your points into airline miles with a bonus. 60,000 Marriott points = 25,000 airline miles. Similar to the old Starwood bonus structure, they will add 15,000 points for every 60,000 points you transfer to airline miles. Finally, Marriott points are also convertible to gift cards, but it takes 60,000 points to redeem for a $200 gift card for Marriott or retailers like Best Buy, Home Depot, or Nordstrom. That ratio isn’t all that great so you’ll definitely get the most value via hotel night redemptions or airline miles transfer. Bottom line. The Marriott Bonvoy Boundless Credit Card (formerly the Marriott Rewards Premier Plus Credit Card) has been refreshed with a new limited-time offer of 100,000 bonus Marriott points. Previously, the standard offer was 75,000 points, so you may consider this a good time to apply. As with all hotel cards, the value is dependent on your unique travel preferences. 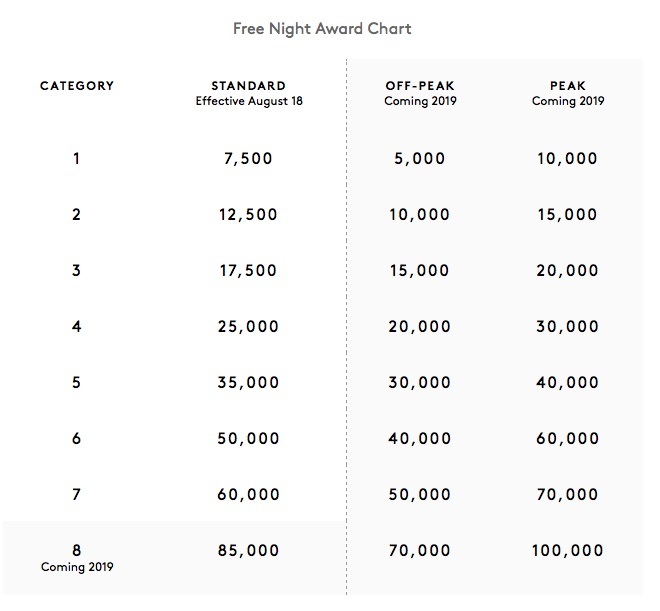 If you stay at Marriott/Starwood properties regularly, the free annual night award should easily cover the annual fee. Learn more about this card HERE. Limited time offer: 100,000 bonus Marriott Bonvoy points after spending $5,000 within the first 3 months. Offer ends 4/24/19. 4x points at U.S. restaurants, U.S. gas stations, U.S. purchases on shipping, and wireless telephone services purchased from U.S. service providers. Receive 1 Free Night Award every year after your Card account anniversary. Earn an additional Free Night Award after spending $60K in purchases on your Card in a calendar year. Awards can be used for one night (up to 35,000 Marriott Bonvoy points) at a participating hotel. Complimentary Marriott Bonvoy Silver Elite status. Additionally, earn Gold Elite status after spending $35,000 on eligible purchases on your card in a calendar year. Elite Night Credit. Each calendar year you can receive credit for 15 nights towards the next level of Marriott Bonvoy Elite status. Welcome offer not available to applicants who have or have had this product or The Starwood Preferred Guest® Business Credit Card from American Express. We may also consider the number of American Express Cards you have opened and closed as well as other factors in making a decision on your welcome offer eligibility. Welcome offer not available to applicants who (i) have or have had the Marriott BonvoyTM Premier Business from Chase, the Marriott Rewards® Premier Plus Business Credit Card from Chase, or the Marriott Bonvoy BusinessTM from Chase, or the Marriott Rewards Business Credit Card from Chase in the last 30 days, (ii) have acquired the Marriott Bonvoy BoundlessTM from Chase, the Marriott Rewards® Premier Plus Credit Card from Chase, the Marriott BonvoyTM Premier from Chase or the Marriott Rewards® Premier Credit Card from Chase in the last 90 days, or (iii) received a new cardmember bonus in the last 24 months on the Marriott Bonvoy BoundlessTM from Chase, the Marriott Rewards® Premier Plus Credit Card from Chase, the Marriott BonvoyTM Premier Plus from Chase or the Marriott Rewards® Premier Credit Card from Chase. This is more specific than before, note the different 30-day, 90-day, and 24-month waiting periods that may now include consumer cards. American Express usually gives you a pop-up warning during the application process if you are ineligible based on their records. This is why you should be looking to get the best possible bonus (like a limited-time offer and waived annual fee) when you do apply. Bottom line. The Marriott Bonvoy Business American Express Card is the new co-branded business card between Marriott/SPG and American Express. Right now there is a limited-time offer. You also get a Free Night Award at card anniversary, which can be worth much more than the annual fee. Southwest now flies to Hawaii! Southwest Airlines offers a unique feature called the Companion Pass, which lets you pick one person to fly with free when you book either paid or award flights. If you either fly 100 qualifying one-way flights or earn 110,000 qualifying points in a calendar year, and you’ll earn the Companion Pass for the remainder of that year the following full calendar year. For example, if you earned it in February 2019, you would have the benefit for the rest of 2019 and all of 2020. You can change your designated companion up to three times each calendar year. 40,000 Rapid Rewards points after you spend $1,000 on purchases in the first 3 months your account is open. 3,000 bonus points after each Cardmember anniversary. 6,000 bonus points after each Cardmember anniversary. 7,500 bonus points after each Cardmember anniversary. $75 Southwest annual travel credit. Four Upgraded Boardings per year when available. 20% back on inflight drinks, WiFi, messaging, and movies. 60,000 Rapid Rewards points after you spend $3,000 on purchases in the first 3 months. Value of Rapid Rewards points. After you earn the required 110,000 Rapid Rewards, redeeming them for flight values varies in a narrow range, but a reasonable approximation from my experience is $1,700 in Wanna Get Away airfare (you are still liable for taxes and fees from $5.60 one-way). Importantly, Southwest does NOT have blackout dates or seat restrictions when you redeem with points. This means that Southwest points are much easier to use than a “saver award” on traditional airlines. Now, if you manage to qualify for the the Companion Pass on every trip that you book with those points, that doubles the potential value of each award redemption. Another option to consider is gift card redemptions. You can still redeem 5,000 points for a $50 a Amazon.com or Wal-Mart gift certificate. That makes 50,000 points still worth $500 in Amazon or Walmart gift cards. Southwest still includes two free checked bags per person. The fees on the other airlines have crept up to $30 per bag, each-way. That adds up. Our family policy is to not try out a new credit card unless it offers us $500 in total value. Just the free award flights from the points are enough to satisfy that rule, and then you can add on the potential value of the companion tickets. The product is not available to either (i) current Cardmembers of any Southwest Rapid Rewards® Credit Card, or (ii) previous Cardmembers of any Southwest Rapid Rewards Credit Card who received a new Cardmember bonus within the last 24 months. This does not apply to Cardmembers of the Southwest Rapid Rewards Business Card and Employee Credit Card products. Basically, you can get one sign-up bonus from a Southwest consumer card once every 24 months. You can also get one sign-up bonus from a Southwest business card once every 24 months. Extending your Companion Pass with Chase Ultimate Rewards points. If you have the Chase Sapphire Preferred or Chase Sapphire Reserve, you can transfer Ultimate Rewards points to Southwest points on a 1:1 basis. The idea is is to book an award flight with those Southwest points while you have the Companion Pass, thus doubling the value of your Ultimate Rewards points as well. Bottom line. Right now, you can earn 100,000 Southwest points from qualifying for just two credit card sign-up bonuses (one personal and one business), which is only 10,000 points short of qualifying for the Southwest Companion pass (and a lot of free Southwest flights!). A Companion Pass earned now would get you a free companion ticket on every flight bought with cash or points for the rest of 2019 and all of 2020. Plus, Southwest still includes two free checked bags per person. Unlimited 2% cash back on all purchases. One-time $500 cash bonus once you spend $4,500 on purchases within 3 months from account opening. $0 annual fee for the first year, then $95 annual fee after that. Cash back rewards don’t expire as long as your account is open. Consider that if you meet the $4,500 spending requirement within 3 months, you will end up with $500 + $90 from 2% cash back – that’s $590 on $4,500 spending (13.1% cash back). 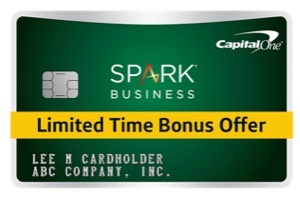 Note that “Existing or previous Accountholders may not be eligible for this one-time bonus.” For comparison, there is also a Spark Select for Business and Spark Classic that are different cards with lower sign-up bonuses but no annual fee. The 2% cash back for all purchases is a strong rewards structure, and you get no annual fee during the first year as well. From the second year onward, you’ll have to weigh that against the $95 annual fee after the first year. The math says that you would have to spend more than $19,000 every year ($1,583 a month) to make the 2% back and $95 annual fee (Spark Cash) pay out more rewards than 1.5% cash back and no annual fee (Spark Cash Select). You can get your cash back upon request in the form of a statement credit or a check. You can also set up an automatic redemption preference; options include: (1) at a set time each calendar year or (2) when a specific threshold ($25, $50, $100 or $200) has been reached. Just go online to capitalone.com or our Rewards Center. You can also redeem for credits for previous purchases, gift cards, and more. Rates for these redemption options may vary and are subject to change without notice. Alternatively, the Capital One Spark® Miles for Business has a offer for 50,000 miles once you spend $4,500 on purchases within 3 months from account opening. 50,000 miles are redeemable for a $500 statement credit towards travel. The travel can be booked directly through airlines and hotels, and there are no blackout dates or award seat limits to worry about. $0 annual fee for the first year, then $95 annual fee after that. No foreign transaction fees. Similar to the offer above, the Spark Miles offers 2 miles per dollar with the $95 annual fee but there is also a Spark Miles Select for Business that offers 1.5 miles per dollar with no annual fee. Unless you know how to leverage one of these international airline miles programs, I would prefer earning cash rewards over the “miles”, since these Capital One “miles” only get their maximum value when redeemed against a travel purchase. If you are looking for a comparison with other strong business cards, check out my updated list of Top 10 Best Small Business Credit Card Bonus Offers. Chase Bank has updated banking promotions for new customers without a Chase Bank account (closed more than 90 days ago and haven’t gotten a bonus in the last 2 years). The first bonus is for their Total Checking and Savings accounts, and if you satisfy that and have a Sapphire credit card, you can upgrade to the Sapphire Banking with higher requirements. Up to $600 for opening a new Total Checking + Savings account. You must move over a direct deposit on the new checking account ($300 bonus), and/or deposit and maintain $15,000 in the savings account for 90 days ($200). Do both, and get another $100, for $600 total. The easiest way to avoid monthly fee is to keep $1,500 in Total Checking and $300 in Savings. 60,000 Ultimate Rewards points for upgrading to a Chase Sapphire bank account. Got a Chase bank account and a Sapphire credit card? They want your business, so take a look at their upgrade offer to Sapphire Banking. You must move over $75,000 in assets (bank deposits or securities) to Chase Bank or Chase You Invest brokerage. You can simply move over some existing stocks, ETFs, or mutual funds via ACAT transfer and your tax cost basis should transfer. Alternatively, you could buy US Treasury bills in the brokerage account as an alternative to Chase Bank’s sad interest rates. You need to also have the Chase Sapphire Preferred or Chase Sapphire Reserve credit card. Together, this could be up to $1,500 total value. If you have the Chase Sapphire Reserve card, the 60,000 points are worth $900 towards travel (or 60,000 airline miles). $900 airfare/hotel/car rental value + $600 cash = $1,500. If you have the Chase Sapphire Preferred card, the 60,000 points are worth $750 towards travel (or 60,000 airline miles). Here are previous posts on the Chase Total Checking bonus and Chase Sapphire Banking bonus with more details.